I was 22 when I joined stocks. Do you think I did the right thing? Below is a interesting question from a young member in our forum. It asks about investing now and enjoying later. Personally, I started investing when I was in the same age bracket – 21, that was year 2010. I have a friend who was also introduced to stocks investing that same time. Now, more than two years later, that same friend of mine just contacted me to ask for my help so she can start investing on her own. Finally! I wonder what pushed her to change mind and make that decision. I’ll ask her next time and update you. 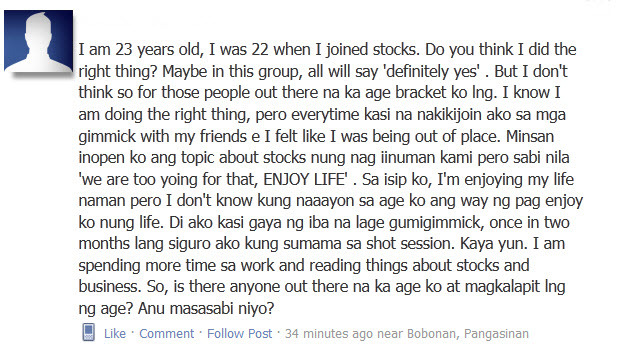 Going back to the question, check here to get to know what other “older” investors have to say! Have a blessed and fruitful week! Have fun investing (while you can invest)! PS2: But before that, let them read first the story of Bo’s maid-now-bookeeper-and-a-millionaire-investor. The truth is… stories move people more often than facts. So share with them first the story of Gina (that’s the name of the maid) who have just turned to a millionaire and now inspires many! Read the account here! Download the ebook for them here. PS4: If you want to learn more about Fundamental Analysis in choosing your stocks – here’s a free tutorial. Click here!